Superfood: the medicine of the future? Hippocrates said: “Let food be thy medicine and medicine be thy food.” Extraordinary elements that grow naturally are able provide our organisms with higher than average quantities of nutrients (vitamins, minerals, fibre, enzymes, mineral salts, antioxidants and phytonutrients), and these are known as “superfoods”. If you enter the term “superfood” into your search engine, you get around 20 million results, and the list of these extraordinary foods is constantly growing even though there is not yet an official definition for them. Almost every day, the scientific community discovers new antioxidant principles and nutrients in some foods, but they are not all real superfoods; it is therefore important to carefully search for scientific proof that certifies the benefits of each product. The current focus on superfoods has probably been encouraged by a growing interest on the part of consumers for food and health, and the trendiest foods will be the so-called longevity foods. Most of these are fruits, berries, spices and seeds that contain active principles that are of particular interest for health. Let us look together at some of these superfoods. By observing the eating habits of Eskimos and their life style, researchers have come to the conclusion that, because they prevalently eat oily fish, the population on average suffered fewer heart attacks and strokes. 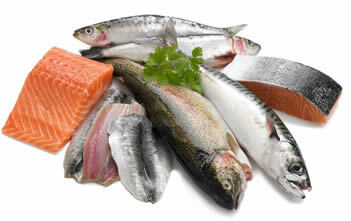 This is the reason for interest in the health benefits of eating oily fish. Oily fish like salmon, mackerel and sardines, rich in omega-3 fatty acids (which favour decrease of bad cholesterol in favour of good cholesterol) in fact help to prevent cardiovascular disease, prostate cancer, loss of sight linked to age and dementia. They are a good source of vitamin D, protein, a number of vitamins in group B and selenium. Bilberries contain pharmacologically active substances such as anthocyanosides (flavonoids). These active principles help to slow down ageing, preventing damage caused by free radicals thanks to their powerful antioxidant action. They offer great benefits for eyesight defects. In particular they help to improve night vision, rapid restoring of sharp eyesight after exposure to light, preventing macular degeneration, hypermetry and cataract. 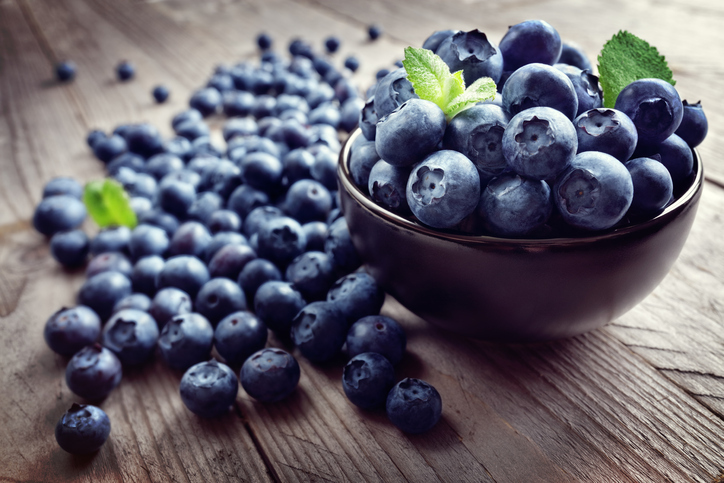 Bilberry extract can also play a significant role in prevention and treatment of glaucoma, due to its effect on the collagen structures in the eye. Bilberries are commonly used to treat varicose veins. The anthocyanins contained in bilberries act by protecting and reinforcing the walls of capillaries and veins. 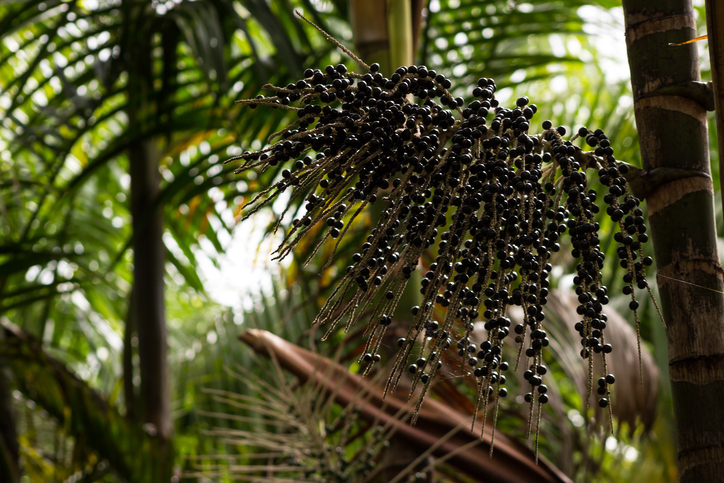 They are small purple coloured berries similar to bilberries produced by a palm tree that grows in Amazonia. 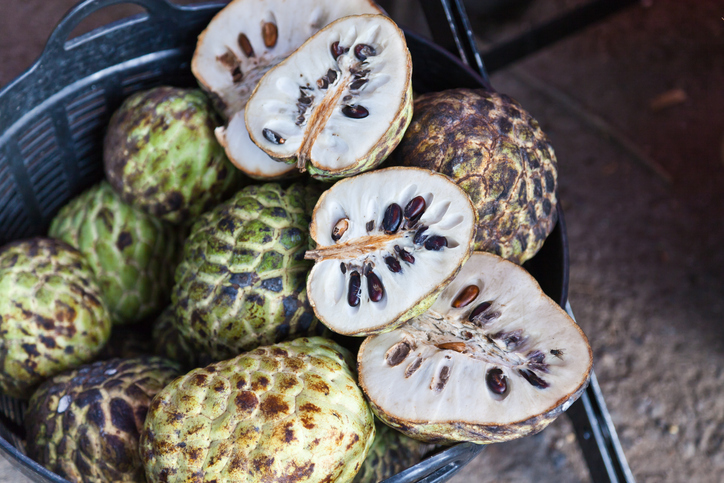 They are considered to be the most nutrient fruit in the whole Amazon forest. They are rich in polyphenols and have antioxidising properties, as well as containing fibre, polyunsaturated fats (omega-3,6,9) and mineral salts (potassium, iron and calcium). They help to lower levels of cholesterol in blood and contain plant sterols, valuable for protecting blood vessels. Additionally, açaí berries are useful for protecting the heart and cardio-circulatory system. 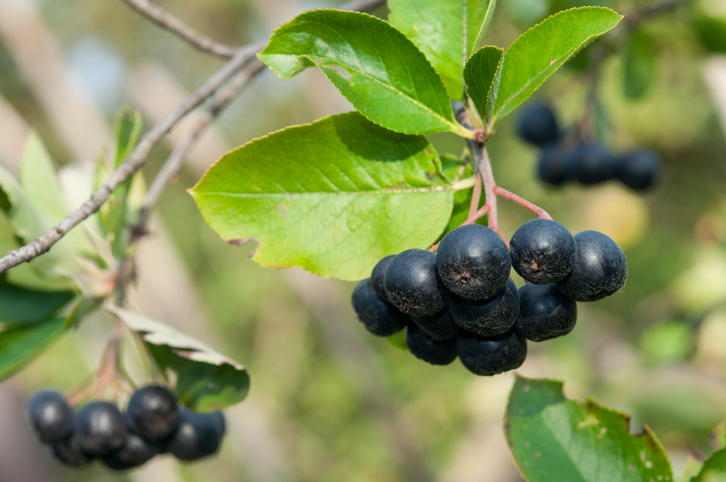 Aronia berries or chokeberries contain anthocyanins in a quantity 3 times higher than bilberries and for this reason are classed as one of the foods with the highest antioxidant properties. They are rich in polyphenols, mineral salts and vitamins; suffice it to say that 100 grams of dried chokeberries provide your body with 93% of its daily need for iron and 34% of its intake of vitamin C, which also plays a key role in the formation of collagen. They boost blood circulation and blood vessels, prevent coagulation of the blood and reduce the risk of cardiovascular problems. 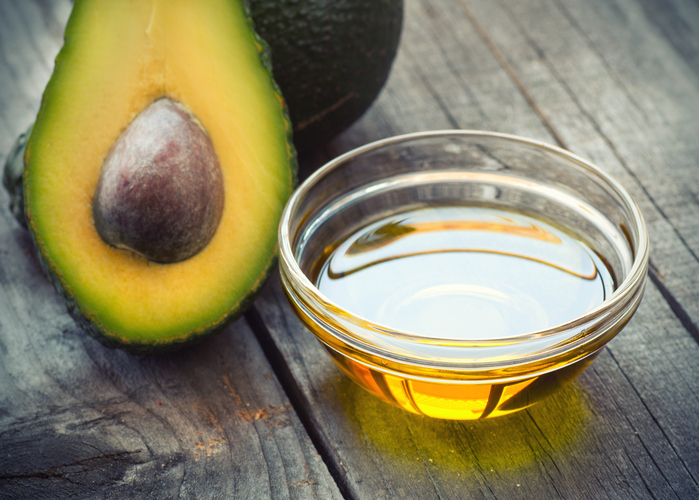 Avocado oil is a high-energy and revitalising food due to the high percentage of essential fatty acids (oleic acid 55-75%; linoleic acid 9-14%; palmitoleic acid 3-7%; and alpha linoleic acid 0.5%). It can be helpful for the prevention of cardiovascular diseases, provided that it is eaten in moderate quantity and raw, because it also contains saturated fatty acids (palmitoleic acid 9-20%). It should be used alongside olive oil and coconut oil to dress salads, make sauces and smoothies. These are reddish berries originating on the Asian plateaus and considered the “fruit for life”. One single berry contains all the main macro and micro-nutrients, essential minerals, nineteen amino acids, six essential vitamins, fibre and a wide range of nutritious substances, including carotenoids such as zeaxanthin, lutein and lycopene. Goji berries nourish and revitalise the organism and reinforce immune defences: they are an excellent and totally natural substitute for conventional synthetic multivitamin products. They are one of the fruits with the highest level of antioxidants in the world and for this reason contrast the harmful activity of free radicals, preventing premature ageing of tissues. 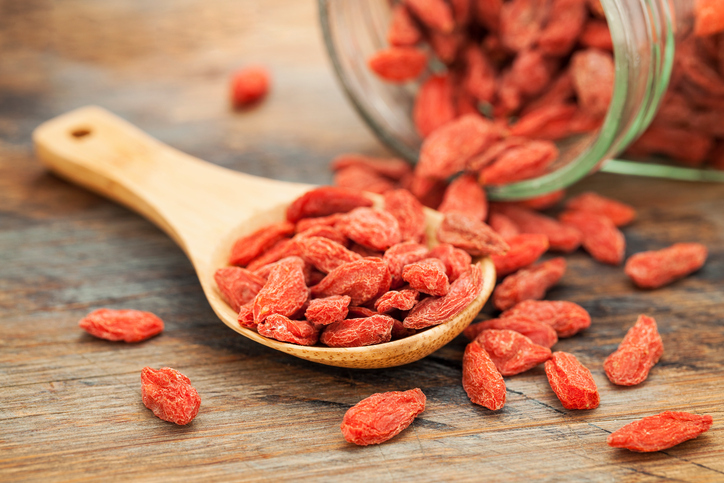 Goji berries are particularly rich in vitamin A, essential for healthy and beautiful skin, nails and hair. Rich in carotenoids, they are also particularly useful for the well-being of eyes. Due to their particular nutritional principles, they help to keep the correct level of glycaemia. Their original name is Wu Wei Zi, meaning the 5-flavour fruit, native of Eastern Russia and Northern China. These berries are considered to be super nutrient and energy increasing, a natural tonic for the body and mind. 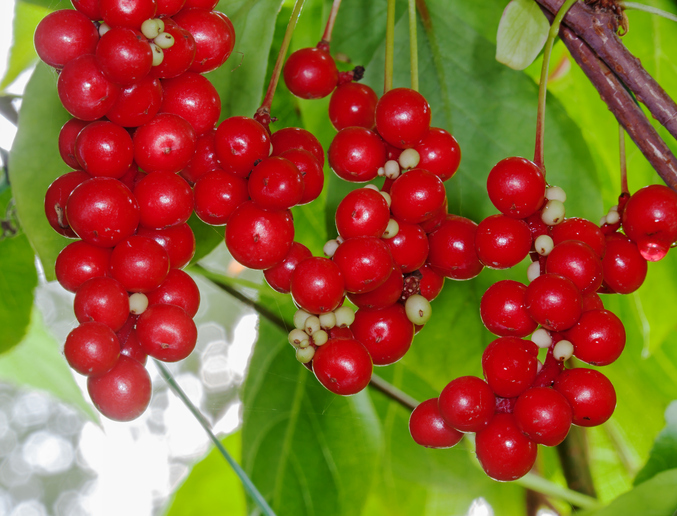 The lignans (schisandrin, schisandrol, schisanterin and gomisin) that is the active principles contained in schisandra and belonging to the class of phytoestregens help to regenerate liver tissue. The main active component is dibenzocyclooctadiene lignans, which seems to have a potential as treatment against oxidation damage to brain cells. 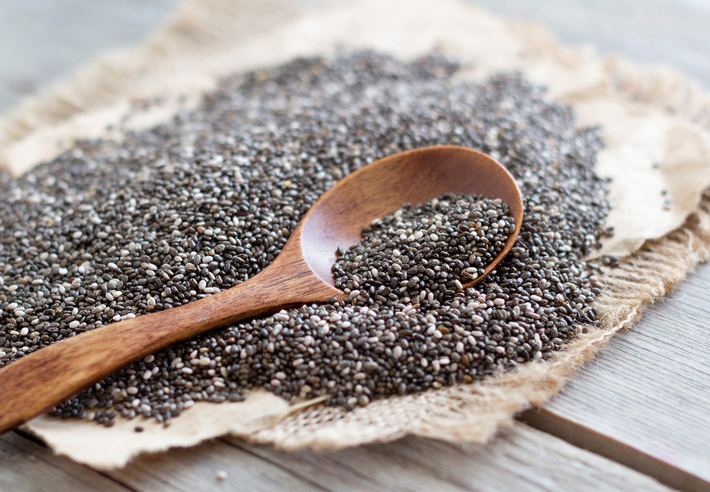 Chia seeds are produced by a tropical plant originating in Mexico. It is said that the Aztec warriors derived the strength to win battles from Chia seeds, or that they used them as a remedy against inflammations and infections: in fact, in Aztec “Chia” means “strength”. They are one of the most abundant sources of complete protein. The combination of protein, vitamins, minerals and sugars in blood ensure a constant level of energy without drops. The seeds are rich in omega-3, in 100 grams there are 17 grams of this fatty acid, a very high concentration and as a result important for the health of the heart. Every beetroot is full of vitamins and minerals, but it is the high concentration of nitrates that have made it a “superfood”. 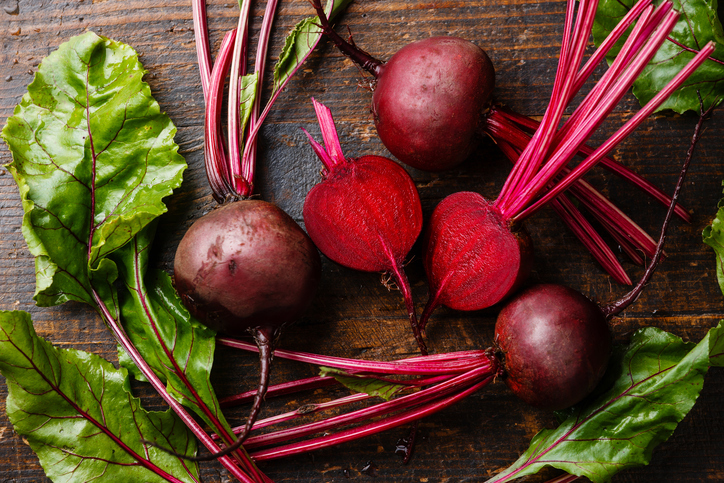 According to a number of studies, thanks to their presence, beetroot juice has a bland effect in reducing blood pressure. Beetroot has antianaemia and remineralising properties, since it is a good source of iron and folates (naturally folic acid). It also contains betaine, magnesium and other antioxidants (in particular betacyanin, effective in blocking cellular alternations). 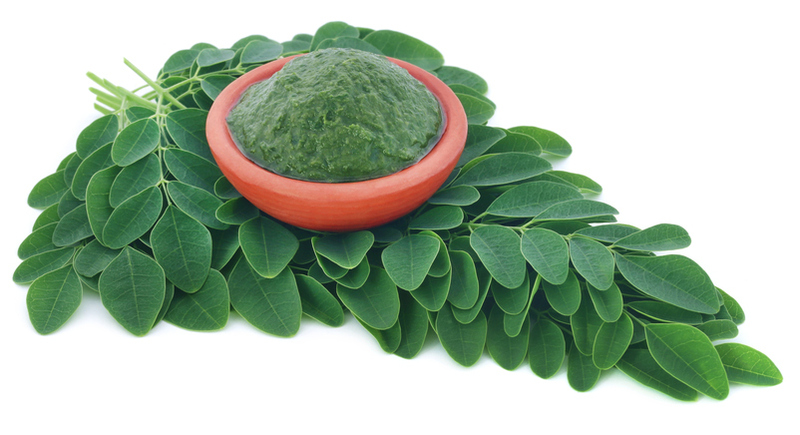 Moringa is an authentic “Tree of Life” from which the powder that is becoming a superfood and supplement appreciated all over the world is obtained. FAO considers moringa to be an important traditional crop and a food that is truly beneficial due to its abundance of vitamins, calcium and iron. The leaves contain 90 nutrient substances, 45 compounds with antioxidant properties and 36 with anti-inflammatory properties. In each of them, in fact, there are no less than 7 times the vitamin C content found in oranges, 4 times the calcium and double the protein found in milk, 4 times the vitamin A of carrots and 3 times the potassium in bananas. 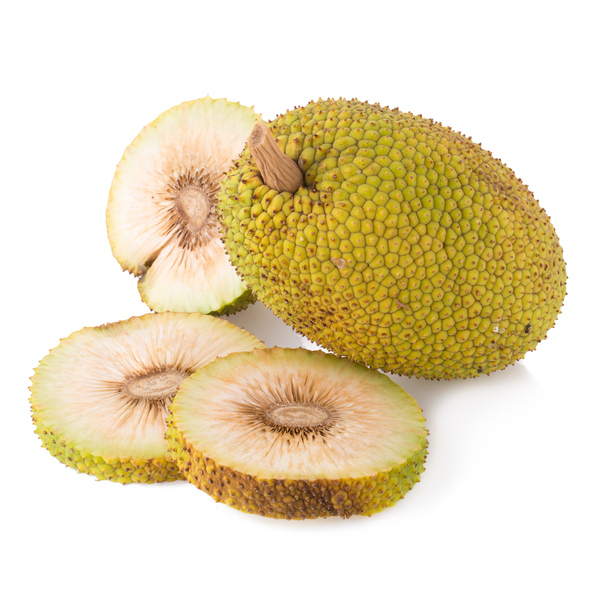 Ulu is the fruit of the breadfruit tree, as large as a melon and with a rough, green skin and white, starchy pulp, the taste of which is very similar to that of newly baked bread. Due to its nutritional characteristics (gluten-free carbohydrates, high energy value, low fat content, potassium, calcium, magnesium, iron, fibre and vitamins B1 and B3), it is a staple food for the populations in developing countries. Ulu succeeds in providing a portion of carbohydrates sufficient for a meal for a family of 5 and contains a quantity of potassium equal to that of 10 bananas! Without forgetting that its proteins have more amino acids than that of soya, while some varieties of this plant are rich in antioxidants and carotenoids. Graviola (or Soursop) is a tropical fruit containing a class of compounds, annonaceous acetogenins, which are thought to be the active principle. It is considered to be a natural antibiotic and antidepressant. It is a highly nutrient food with certain antioxidant properties that considerably improve the immune system when eaten; additionally, it is used by rain forest populations as an antiviral or to treat anxiety, flu, agitation, insomnia, muscular spasms, gastritis, ulcers and many other disorders. Also known as Arthrospira platensis, it is a blue-green alga that lives in salt water lakes with alkaline waters. 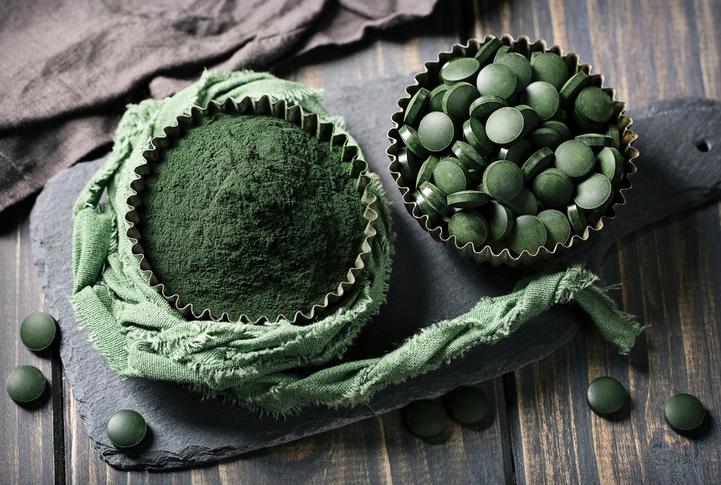 Spirulina has very many nutritional and therapeutic properties. It was already harvested, dried and used as food by the Aztecs over 400 years ago. Due to its high protein content, it comprises all 8 essential amino acids, around 60-70% in dry weight, and it is also rich in vitamins (A, D, K and group B vitamins), minerals (iron, sodium, magnesium, manganese, calcium, iodine and potassium), essential fatty acids (omega-3 and omega-6, which act on levels of cholesterol and triglyceride) and other nutritious substances. It has been proposed as a nutritional food to fight hunger and malnutrition in the world and is recommended both by NASA and ESA as one of the staple foods to be used during long-term space missions. 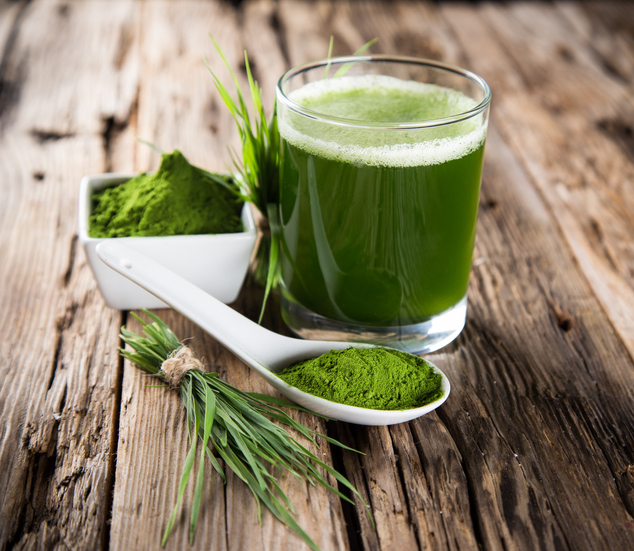 Because of the substances it contains, spirulina is used above all as a natural supplement to stimulate immune system antibodies. It has beneficial effects on health due to prevention of hypercholesterolaemia and hyperglycaemia, as well as protecting tissues from damage caused by free radicals, reducing their toxicity for the liver and kidneys. It is a source of vegetable protein. Not only does it aid the digestive process, stimulate metabolism and have an anti-ageing action, but it also plays a decisive role in cell detoxification and boosts psychophysical energy. Additionally, it treats arthritis, reduces fatigue and is so full of nutritious properties that it suppresses appetite, thus helping weight loss, moreover it is a natural deodorant, its juice purifies mouth and skin toxins, cleanses the liver, reinforces the immune system, revitalises and regenerates skin cells and stimulates circulation. It also helps to heal wounds by applying a small quantity of its juice to the wound. Pomegranates are rich in antioxidants, and are an excellent source of vitamins and minerals including iron, calcium, magnesium, phosphorus, potassium and, to a lesser extent, manganese and zinc. They favour the formation of collagen, essential for keeping skin elastic and preventing wrinkles. Because of their antioxidant properties, they help to fight oxidative stress and signs of ageing, and are an excellent source of tannins, antioxidant substances that have beneficial effects on the cardiovascular system. Unsaturated fatty acids, including punicic acid, and some phytoestrogens, which are abundant in this fruit, may be of help in cases of hormonal imbalance. 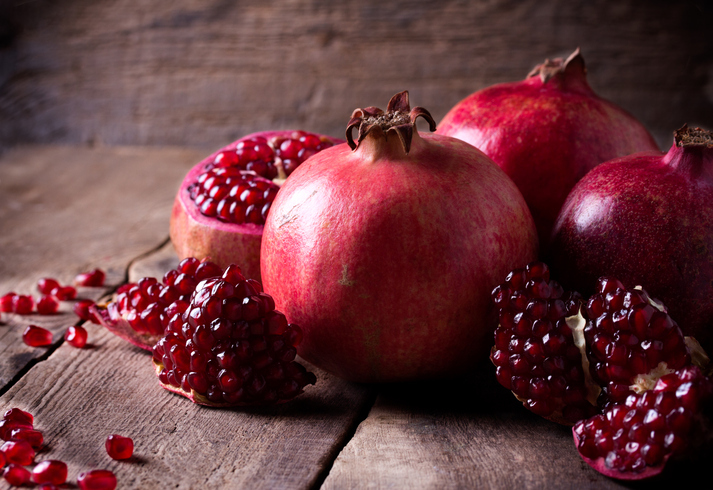 Thanks to their drainage properties, pomegranates favour reduction of the excessive fluid retention and counter the sense of swelling and heaviness caused by poor circulation. The European Food Safety Authority has positively judged the scientific bases for the health benefits provided by superfoods. However, it is unrealistic to expect that a limited range of ‘superfoods’ can do miracles in our diets. Consequently, in order to guarantee a balanced intake of nutrients to our organisms, it is essential to increase the range of nutritious foods in our diet, supplementing them with foods recognised to be ‘super’.